Valerie from SewCranky kindly for her birthday gave away a present to someone else..and luckily for me, it was me! In this lovely birthday package was the Singer sewing guide, vintage buttons and some lovely vintage patterns. In a strange turn, I very much have fallen in love with the kaftan pattern. While it won’t be as flattering on me as the pattern envelope suggests, it sure will be comfortable! It’s quite trendy these days for kids to have towelling hooded gowns JUST LIKE THIS KAFTAN. I’m now on the lookout for some well priced towelling as this baby takes about 5 metres of fabric. 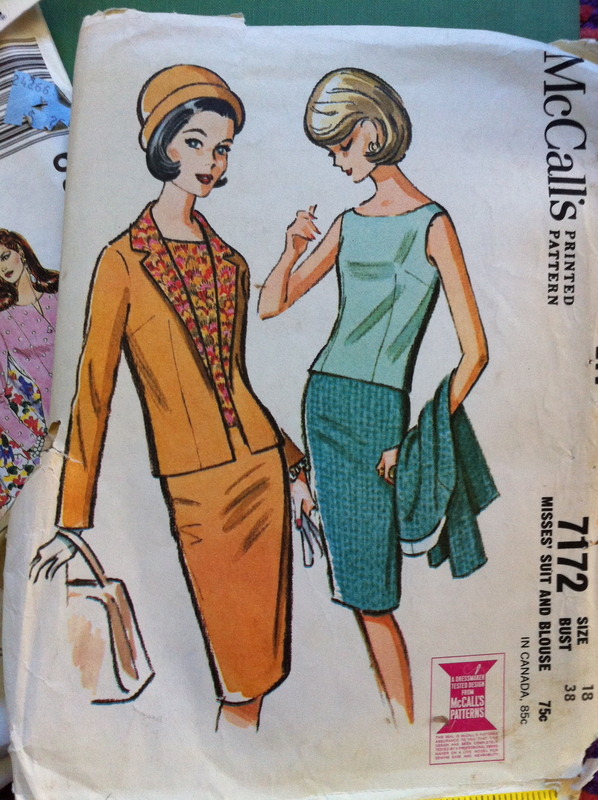 The beautiful gem here is the 1963 Mc’Calls Misses’ suits and blouse. Isn’t it gorgeous? To ensure I’m still sticking to my sewing plan so only the skirt will get made at this stage. The skirt is a nicely shaped simple pencil skirt, which could take place of the Burda Jenny skirt. I’ve drafted up a muslin already but unfortunately one of the pieces didn’t fit on the fabric, so one piece had to be cut out on cross grain instead of the straight grain. The detail on this pattern is lovely, the lining of the jacket matches the blouse and the pattern layout implies you will be making all three items. This is an ensemble people. What has been really fun is trying new ways to pattern trace. Previously I’ve always traced from a pattern onto a 10m roll of tracing paper from Tessuti in Melbourne, but I’m going to try out tracing onto muslin with dressmakers carbon paper, and also sewing using swedish tracing paper. Does anyone have an aussie supplier of giant sheets of dressmakers carbon paper?